I had the honor of interviewing Michael Emerson at the 'Divided by Faith' 10th-anniversary conference. 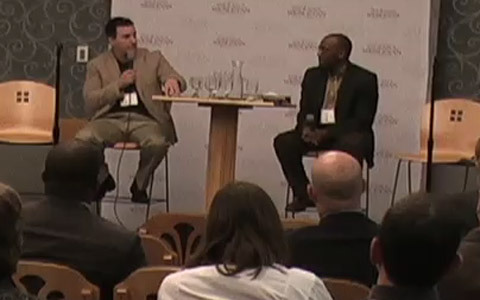 The interview segment is followed by a panel discussion on pursuing diversity in the church that features Dr. Wayne Schmidt (Wesley Seminary at Indiana Wesleyan University), Rev. Alvin Bibbs (executive director of Multicultural Church Relations, Willow Creek Association), Dr. Curtiss DeYoung (Bethel University), and Rev. Kyle Ray (Lead Pastor, Kentwood Community Church in Michigan). Dr. Emerson and I were called back up during the concluding Q & A session. All in all, it was a very engaging conference, with provocative and insightful presentations from a variety of Christian scholars who all share a passion for reconciliation and unity in the church. I’m so grateful to have been a part of it.